Start to get paid by traveling to some places you love today because some people were started several years ago. So don’t bring too many questions to start it, here are 5 tips on how to make money traveling that you can start right now. Many people record their journey, share their traveling experience, their live, adventures, or anything unique that can be recorded and share through social media or YouTube. People love something new, something unique or a wow to see. This what make vloggers can make their living even better from people who work 9 to 5 on a daily basis. Similar with vlogger but this time, people share their travel experience by blogging. They write down all of their traveling experience on their blog, share some tips, how to do something, and what to do first. They were all based on a travel blogger experience. People tend to learn from someone experience before they do the same thing to get a better or -at least- same experience with their precursor, which is a travel blogger. Some travel blogger may earn $5000/month, once they established. It’s crazy but, yeah, that’s what it is. It’s a smart tip on how to make money traveling. Work as a tour guide than you’ll make yourself traveling, and get paid. As a first-timer, all you need to do is research and train your communication skill. How to conduct research? Just visit TourFromBali, and you’ll find all the easy-to-sell destination you need and offer it to your customer. This is an excellent way to make money online while you away. Travpart is the solution for this. Register as a sales agent and create your tour packages, then you’ll earn your first commission. And if someone buys your tour packages, you’ll earn a big commission. Selling travel packages is entirely different from guiding. On guiding, you need to walk with your client, but on selling travel packages, you might find yourself at a pool or a beach while your client is visiting their own destinations. It’s a work from home job, and this is an excellent way on how to make money traveling. Being a travel photographer not just taking a picture while you’re traveling. It’s more like an experienced photographer on travel. You need to have an experience, or you can learn from the expert in a short course. Some industries will pay big money for your images as their campaign. You can earn hundreds or even thousands dollars just for a perfect shot. So, this is worth to try. These are 5 tips on how to make money traveling. Find your passion, work it as an expert, keep focus, and then you’ll know that it’s good to make money traveling. Since technology becoming more widespread, people are easily get connected to each other. Merely by using a smartphone, Laptop, or other gadgets which are connected to the internet. Not only to conduct an everyday conversation but also as a mean of a job. The high number of people are intent to work from home since the internet becoming more and more accessible from urban to a rural area. Ability to control working hours is the main reason why in this millennial era, people prefer not to attend 9 to 5 jobs as it happens to generations before. And to meet this millennial job seeker need, many sectors offer work from home opportunities, such as travel or hospitality, sales, computer, IT, design, and loads more. One of the travel company that offers such an interesting kind of job is Travpart. 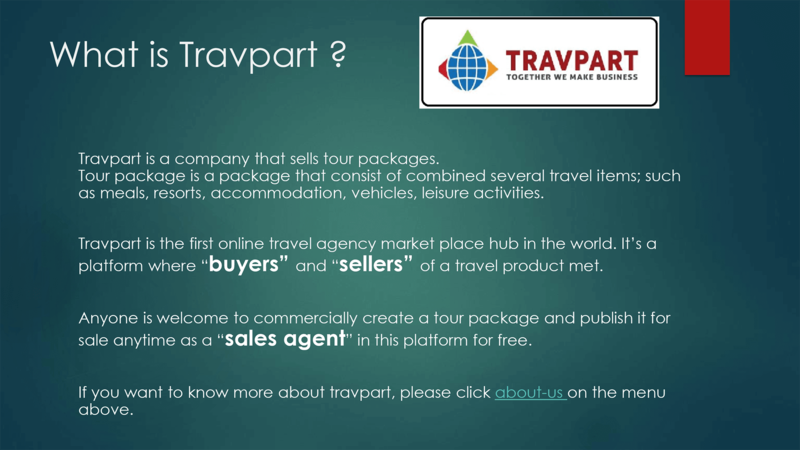 Travpart is a company that sells tour packages. The packages itself is a combination of several travels items such as meals, resorts, accommodation, vehicles, and leisure activities. Travpart allows you to work from home just by selling its tour packages from the website. As you can see, when you are applying to a job conventionally, you’ll meet those creepy preparations from A to Z. 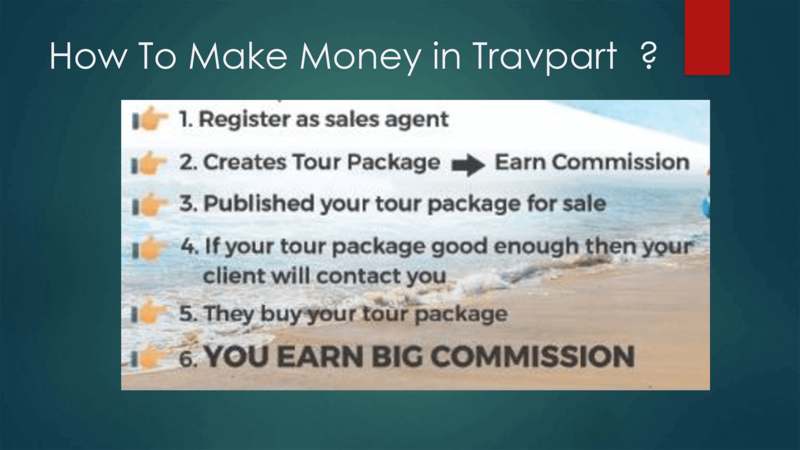 While if you start to work from home by joining Travpart, you just simply sign up for free then you can start making money online from your gadgets, from your home. 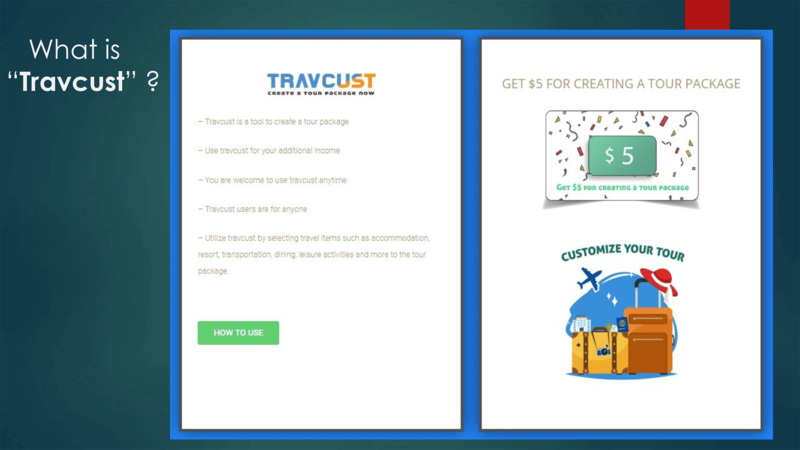 Travpart platform spoiled you with plethora tools just to make you easier to get your first online cash. 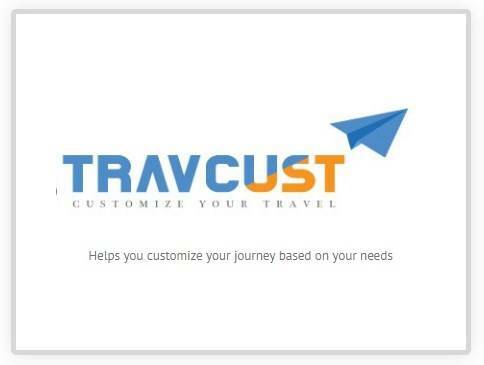 One of the excellent tools to let you customize your travel packages is Travcust. 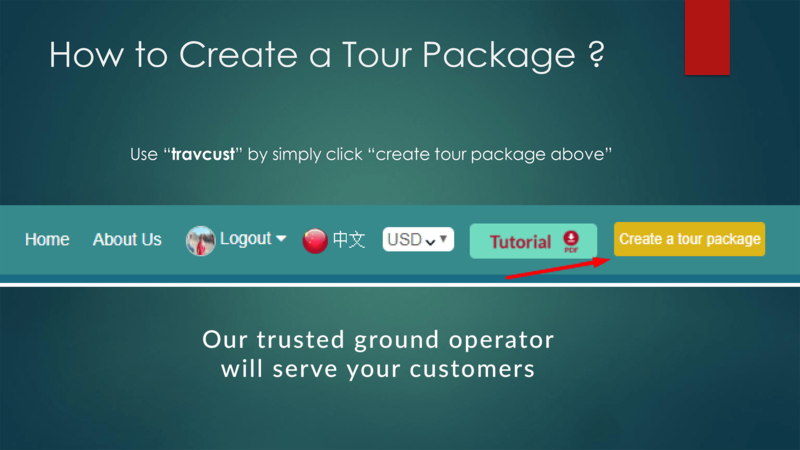 You can boost up your earning by utilizing this tool to create your own tour packages and sell it directly from the website. Combine your exciting tourist destinations, delicious meals, five-star accommodation as your first-class tour packages with Travcust. 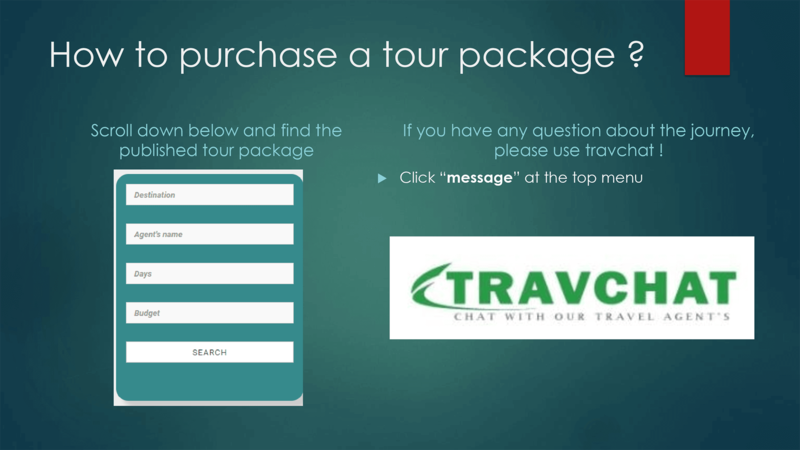 Once you put your best tour packages on the shelves, get ready to be contacted by your customer. Travchat is the tool that lets you communicate with the potential customers before they are making a purchase. 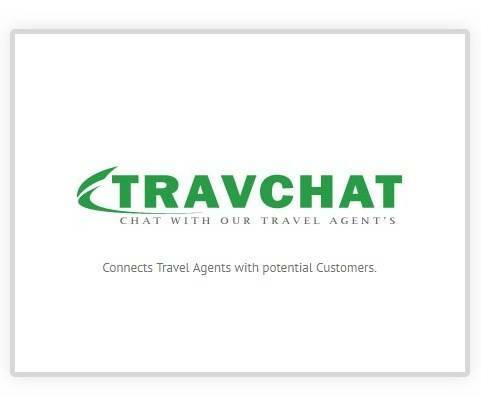 Travchat is a safety gate for customers to interact with travel agents. 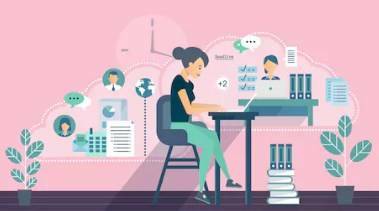 Since work from home altering into a big mainstream mode of working, it brings a new culture on how people work and shaping remote work as a promising way to make money online for everyone. Begin your journey with this surprisingly cheap tour in Bali for 6 days, and you will explore the beautiful Bali island. You will travel around the island and visit Bali’s incredible destinations. Bali has a lot to discover, from the traditional culture to beautiful nature is going to bring a wonderful experience to your journey. For all of those joy, TourFromBali offers you the best price at only $255, but if come for a group of four, it will cost less than $2000. It is a surprisingly cheap tour in Bali, and here what you can get. Start your first day by relaxing at a hotel or walk around the town freely. 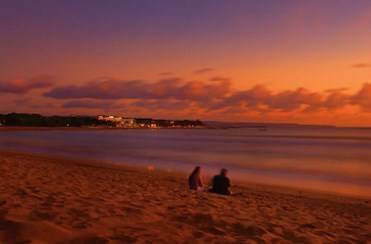 But if time permits, it is recommended to enjoy stunning sun set stroll on the white sand beach, Kuta. Then, you can taste a delicious barbeque at the seaside with romantic nuances. It’s the best options to start your day with this cheap tour in Bali. Explore the east side of Bali, where you can visit a historical building of Kerta Gosa, a well preserved and traditional Tengganan village, the former royal palace of Tirta Gangga where you can see a beautiful royal water garden around the building. The last destination on your second is at gorgeous Ujung Water Palace at Karangasem. It’s a stunning view of this landscape become the main attraction of this place. You will visit the north side of Bali where the iconic Ulun Danu Beratan Temple is located. It’s a holy temple, and it has a floating effect when the lake’s water level rise. Next, you will visit Lovina beach where you can rent a boat and see dolphin following your boat. Before heading back to your hotel, feel the warm of Banjar Hot Spring in the midst of the jungle, located near Lovina beach. Visit the heart of Bali, Ubud. Step in at Celuk village to see the famous Barong Dance performance, and continue to Goa Gajah and Tegalalang. Tegalalang is known for its beautiful rice terrace. The Sacred Monkey forest is the last destination of the day. It’s Ubud’s most popular destination. Inhabited by thousands of long tail monkeys, and Monkey forest has become its natural sanctuary. Exploring Bali is not enough for just one day. 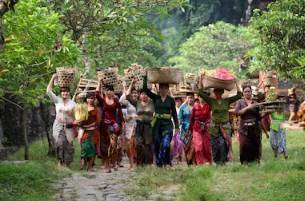 The first trip is to traditional art Batubulan village, visiting the UNESCO World Heritage site nominee of Jatiluwih Rice Terrace. Never miss this place when you visit Ubud, Bali. Tanah Lot is the final destination of the day. A beautiful place where you can watch the sunset from Bali’s amazing landmarks. It’s a popular spot for photography. The first visit is at Garuda Wisnu Kencana cultural park. It is located at Ungasan, Badung. You can see a traditional dance performance and concerts frequently. 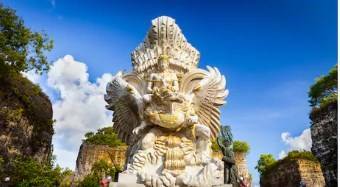 There’s a big sculpture of Garuda Wisnu Kencana, and it’s become a favorite place to visit around Kuta. The best surf spot is at Padang Padang Beach. It’s located near the Bukit Peninsula. Padang Padang Beach has a beautiful view and has become a set of a Hollywood movie Eat Pray Love. Before ending your journey on day sixth, experience a romantic dinner at Jimbaran Sea Food private beach. It’s a great offer from TourFromBali for its cheap tour in Bali package. So, lock your date and go for the trip. Still figuring out how to travel deep into Bali that won’t break your wallet? Cut it. 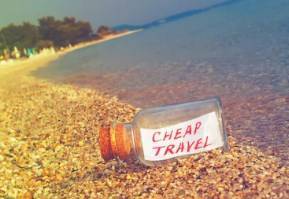 Here are 5 popular and cheap Bali tour travel packages that we picked up for you. These cheap Bali tour travel packages have a perfect budget choice you can choose, but still, let you enjoy Bali island and its cultural and wonderful attractions. Visit Bali traditional Tenganan village, where traditional art craft is still well-maintain by the villagers. Tenganan village is also known as the oldest ancient village in Bali. How their lifestyle, social life, and the way they nurture nature is worth to learn. Stop by at Goa Lawah Temple. It’s a sacred temple where thousands of bats are nesting inside. 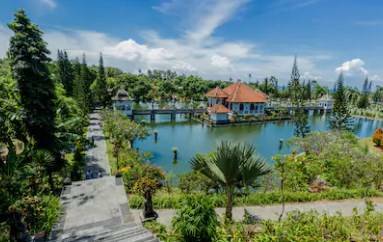 There also Tirta Gangga, a royal water garden located in Karangasem. It’s a beautiful place with its scenery, water fountain, and an exotic swimming pool. Travel at the north side of Bali, where you can visit the wonderful site of Gigit Waterfall, the famous and iconic Ulun Danu Temple at Beratan lake. Ulun Danu Temple also known as floating temple, where you can see its floating effect when the water level’s rise. A beautiful Lovina Beach where you can see the dolphin up close from your boat, and after a long journey, try to recharge your energy at Banjar Hot Spring. It’s a perfect place to relax in a natural hot spring in the mountain. 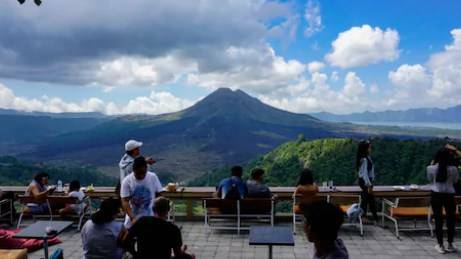 Kintamani is a village in a highland near Batur mountain where it has a magnificent landscape and stunning view from the top. TourFromBali will show you magnificent spots nearby. Around Kintamani, you can visit an archeologist site of cave and temple of Goa Gajah, a temple site which consists of ten temples called Mount Kawi temple, and a Holy Spring Water Temple at Tampak Siring. 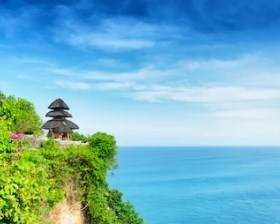 This cheap Bali tour travel packages will bring you to one of six Bali’s spiritual pillars of Uluwatu Temple. It’s located on top of a steep seaside cliff which made it a great spot for photography. The best place to watch a sunset with Indian Ocean backdrop, and watch the famous Kecak Dance and Fire Dance at the temple. Near Uluwatu temple, TourFromBali will bring you to Garuda Wisnu Kencana. A place of a giant sculpture of Garuda Wisnu Kencana located and you can see traditional dance and theatre performance frequently. At the end of your tour, have a romantic dinner and taste a delicious Jimbaran seafood with a beautiful view at the seashore. A wonderful heart of Bali, known with its traditional art and world-famous rice terrace. Ubud gives you the best cultural experience by exploring its fascinating art and history. Tegalalang Village is where the famous and beautiful rice terrace located. A must-see place while you in Bali. 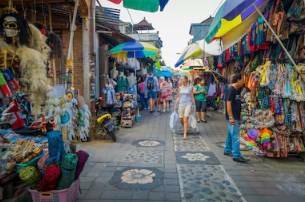 Set out to discover traditional villages with their fine art handicrafts at Ubud Batuan village and Celuk Village, and stop by at Ubud Art Market where all of the collections can be purchased from here. 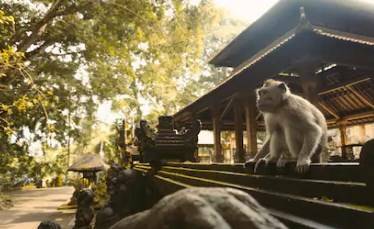 Round of the tour by visiting Ubud Royal Palace and Ubud Monkey Forest, a sacred forest inhabited with thousands of long tail monkeys. TourFromBali gives you the best experience through its cheap Bali tour travel packages. This tour is perfect for your first-time journey on the island. What Is The Best MICE Travel Services in Indonesia? Mice travel services in Indonesia are rapidly growing as it has direct support from the government to Increase the Indonesian economic. 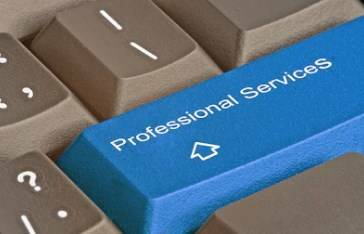 The government advises the public to maintain the professionality on MICE travel service in Indonesia. This statement is opening wide a chance for the public to start a business in a kind and level up the intensity of the competition. It means, people will have to be more detailed on selecting the best MICE travel services in Indonesia. 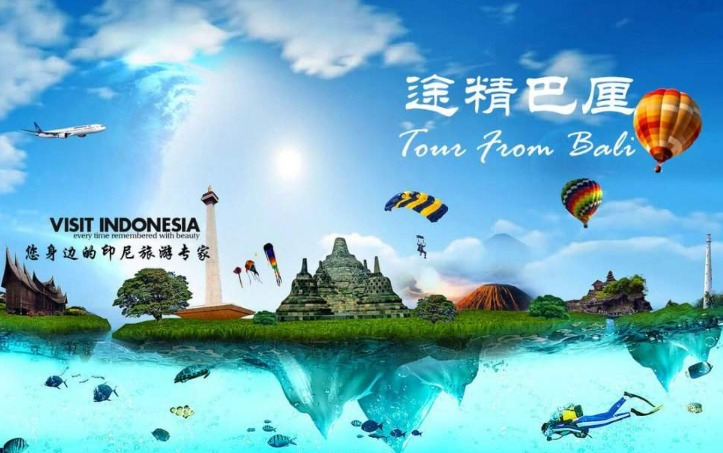 As a professional MICE travel services in Indonesia, TourFromBali stands out among the competitors. Five-star facilities are set to meet all your exclusive need. The top list of places in Bali where you can hold a meeting for your corporate retreat is on their database. Manage by local professional talent with warm hospitality and passion has brought TourFromBali as one of the best MICE travel services in Indonesia. TourFromBali has support from local authorities. They are cooperating with The Ministry of Tourism and Culture. TourFromBali also trusted by several companies to hold some events. Start with a Fashion show, bank training activities, traditional Javanese dance competition, concerts, fundraising events, local television programs, wedding events, and many more. Basically, they can manage almost all events as they have a wide range of the local network. Their experience in handling some events rise their popularity among other competitors. You can access their managed activities from their friendly-designed website. 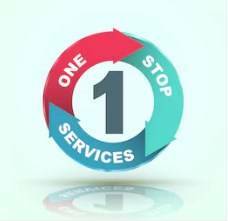 Their services are getting perfect as they can provide you with one-stop service. It’s a service that is designed to give you a simple service on pursuing your need. TourFromBali maybe the only MICE travel service in Indonesia which compiling many services on one table. Following the process, they will choose the best site for your company retreat, providing a virtual design of live events and reflect the grace of Bali, hotels reservations and arrangements, dinner and luncheon, facilities and hardware management, registration desk, and events souvenirs. As they said on their website, ” we’ll take some load off your shoulder and help you organize the MICE, and your organization deserves!”. In the beginning, you will have a face to face consultation to understand all your needs adequately. Then, TourFrombali will design the site, cost, and its benefit for you. When you confirmed the grand design, they will start to set everything up until your activities begin. While that happens, they will keep maintaining good communication and coordination so you can follow the progress remotely. TourFromBali service is also performing a summary of meeting and service survey assessment to give you a brief report on what has been done on the process. And when your event has wholly done, you can finish the payment. This process shows that TourFrombali gives you a guarantee because you can complete your payment after. As a MICE travel service in Indonesia, TourFromBali offers some excellent services and facilities for their customers. It is the best reason to choose TourFromBali as your MICE travel service in Indonesia.